The long-brewing, all-electric Mitsubishi i-MiEV has finally gotten the production green-light and a sale price. It's a rather bracing $47,000 for the Japanese market. Spendy, but no gasoline necessary is a pretty killer feature, right? The production i-MiEV looks a whole lot like the ones that've been running through fleet testing and the press gambit for a while, so the styling isn't much of a shocker, the price is a bit on the steep side for a fairly compact ride though. However, it is the first to market with a new electric vehicle available to the general public. Well, first in a relative sense, since electrics were around in the early parts of the 20th century, and again in the 90's, and in the Tesla... well okay, it's the first relatively cheap modern EV. It's powered by a 64 HP electric motor with 132 lb-ft running off a 16 kWh lithium ion battery. With a total vehicle weight of 2,425 lbs, that puts the range at about 100 miles, depending on how heavy your foot is. Pretty good for a passenger EV, still, it'll be a while before we plunk down that kind of dough for a limited-range jellybean. Mitsubishi Motors Corporation today, on World Environment Day, unveiled the production version of the i-MiEV1 2 new-generation electric vehicle (EV), describing it as "the pioneer that will open the door to the next 100 years of our automobile society." The i-MiEV will go on sale on the Japanese market in late July of this year. 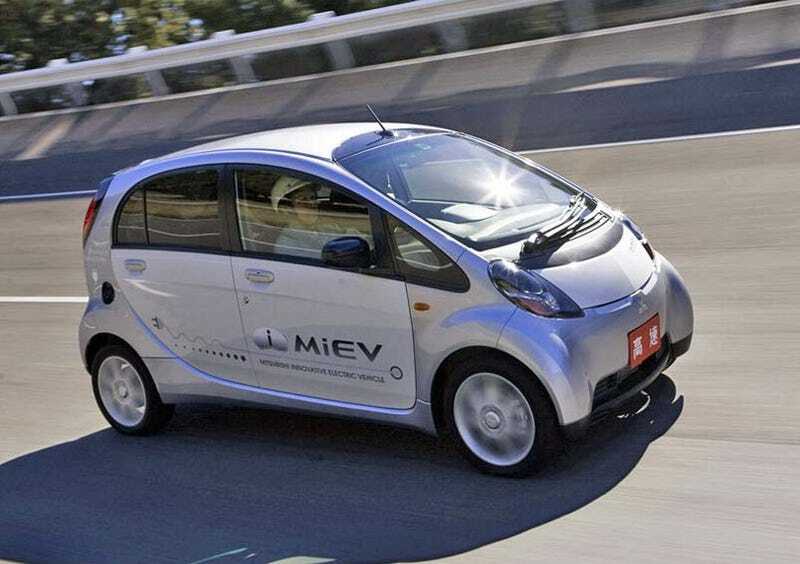 The i-MiEV represents the crystallization of some 40 years of electric vehicle development at Mitsubishi Motors. The company is presenting the production i-MiEV as the ultimate eco-car, a solution to the various challenges the automobile faces today including environmental pollution, global warming and the depletion of petroleum-based energy supplies. The company will continue its extensive collaboration with both private and public sectors in Japan and overseas in developing infrastructure to promote ownership of EVs. Mitsubishi Motors expects to distribute, on a maintenance lease3 basis, some 1,400 i-MiEV models in fiscal 2009 principally to corporations and to local authorities. The company plans to start sales of i-MiEV to individuals in April 2010 and will start taking orders on the Mitsubishi Motors web site in late July of this year. 2: i-MiEV : For the full production model a hyphen has been added to the name by which the advance experiment and proving models have been known. 3: Maintenance lease: A lease in which the monthly payments include some of the taxes, insurance and maintenance costs. The i-MiEV makes maximum use of the long wheelbase that stems from its base model the "i" minicar's rear-midship layout to install a large capacity lithium-ion drive battery under the floor and the power unit under the luggage compartment. This provides a cruising range that is ample for everyday use without compromising the generous seating or luggage space of the "i." The introduction of the MiEV OS (MiEV Operating System)4 - an advanced integrated vehicle management system into which the company has poured its wealth of know-how garnered from many years of EV research and development - has provided the kind of high performance and reliability that befits a new-generation EV. 4 Generic name for the integrated vehicle management system developed by Mitsubishi Motors for new-generation EVs. The i-MiEV is a zero-emissions vehicle (ZEV) which produces no CO2 emissions while being driven. Even when the CO2 gas emitted at power generating stations is taken into consideration, the i-MiEV generates approximately one-third of the CO2 produced by the gasoline "i" minicar (Calculated in-house based on the average of electric energy frameworks in Japan). The i-MiEV is very economical because it only uses electrical energy as its power source. Also, depending on electric power company rate fees, the running cost can be reduced further by charging the battery when off-peak (late night) rates apply5. 5An application must be submitted to the electric power company to qualify for domestic late night rates. The i-MiEV delivers the quiet and comfortable motoring experience only possible from an internal combustion engine-less EV. Maximizing the excellent response and high low-end torque inherent to its electric motor i-MiEV enables a level of responsive and powerful performance that surpasses that of the gasoline-powered turbo engine "i" minicar. The i-MiEV has a single-charge range of 160 km6 in the Japanese 10-15 mode urban driving pattern. This gives it a range that is ample7 for everyday minicar use. 7 A nationwide survey in Japan indicates that on average 90% of car drivers cover less than 40 km/day on weekdays and that 80% cover less than 60 km/day at weekends and holidays (in-house research). The i-MiEV uses a 3-way charging system that allows the drive battery to be charged at home or when out and about. For normal charging i-MiEV is connected to either a standard 100-volt or 200-volt domestic outlet using the charging cables supplied with the vehicle. The i-MiEV's battery can also be "quick charged" at quick-charge stations which are currently being established throughout Japan. 8 Actual charging times may vary depending on such factors as air temperature and power source status. ** The normal charging gun and normal charging connector were jointly developed by Toyota Motor Corporation and Yazaki Corporation. The i-MiEV is powered by a very high energy-density lithium-ion battery manufactured by Lithium Energy Japan9. The large-capacity drive battery is comprised of 88 lithium-ion cells connected in series and is installed under the floor in the center of the vehicle. This configuration contributes to outstanding handling and stability due to the car's low center of gravity. 9 Joint venture established on December 12, 2007 between Mitsubishi Motors, GS Yuasa Corporation and Mitsubishi Corporation to develop, manufacture and sell large-capacity and high energy-density lithium-ion cells for EV use. The i-MiEV uses a high-efficiency compact and lightweight permanent magnet synchronous electric motor specially developed for the vehicle. It generates maximum torque from low engine speeds to deliver powerful response and a comfortable ride experience. When the vehicle slows down the regenerative brake system causes the motor to operate as a generator. The electrical energy recovered is stored in the drive battery. The i-MiEV uses a lightweight and compact single-speed reduction gear transmission, exploiting the high low-end torque inherent to the electric motor and eliminating the need for complex gear shifting mechanisms as found in internal combustion engine powered vehicles. The i-MiEV comes with a compact, lightweight on-board charger that allows the drive battery to be charged using a domestic 100V/200V AC line. The DC/DC converter is used to charge the 12-volt auxiliary battery and power electrical equipment. It is integrated with the on-board charger in a single unit to reduce size and weight. The i-MiEV 's motor is driven by an alternating current. The inverter converts high-voltage direct current from the drive battery to alternating current and supplies motor with the power required to drive the vehicle. The combination meter instrument cluster is comprised of a power meter that presents a visual display of power consumption and energy recovery status, a drive battery residual charge indicator that indicates how much remaining power there is left in the drive battery, and an available range indicator that displays an estimate of how far the vehicle can be driven on the basis of average power consumption over the last few kilometers. The shift selector provides the three positions described below that allow the driver to choose between maximum fun, maximum economy or maximum regenerative brake bias. * D-position: Generates gutsy torque in direct response to accelerator input and allows the driver to enjoy i-MiEV 's performance potential to the maximum. * Eco-position: Reduces power output and consumption to deliver maximum economy. * B-position: Increases the regenerative brake bias. Power output is the same as for D.
The i-MiEV 's climate control system features air conditioning with an electrically powered compressor and a heating system which circulates warm water heated by an electric heater. The control dial provides six-step manual adjustment of both cooling and heating temperatures. The system reduces power consumption by minimizing occasions when both cooling unit and the heater operate together. The high-voltage system, battery pack included, is located inside the body frame and is further protected by a well-crib frame against damage from any direction of impact. The MiEV OS (MiEV Operating System) gathers data and information from all the major EV components to provide integrated management of the i-MiEV 's performance. The advanced management system constantly monitors battery status and the energy recovered from the regenerative brakes while regulating output to ensure smooth and powerful acceleration from a full stop. As a result the system optimizes and minimizes energy consumption while delivering road performance that is comfortable, safe and reassuring. The range of 8 body finishes includes monotones and two types of 2-tone color schemes. Three monotone colors are offered: White Solid, Cool Silver Metallic and Raspberry Red Pearl (factory option). * Type A: The two 2-tone color schemes that have been used to date to highlight the i-MiEV 's originality are available: Red Solid / White Solid and Cool Silver Metallic / White Solid. * Type B: In addition two new 2-tone color schemes are available. "Clean image:" White Pearl / Ocean Blue Metallic and White Pearl / Mint Green. "Premium image:" Cool Silver Metallic / Black Mica. The i-MiEV is the first minicar10 and the first Mitsubishi Motors model to use LED headlamps, which throw a longer and wider low-beam pattern while also cutting power consumption. The rear combination lamps also use fast-illuminating LED emitters for the tail and stop lamps, making these lamps more instantly visible to following vehicles. 10 As of end May 2009, according to Mitsubishi Motors research. The i-MiEV uses PBS (polybutylene succinate)-bamboo fiber Green Plastic for the tailgate interior trim. The use of PBS-bamboo fiber cuts life-cycle emissions (from extraction of raw materials to final disposal of product) of CO2 by some 10 percent compared with polypropylene. The i-MiEV is available with the Mitsubishi Multi-Entertainment System (with a 7-inch display and SSD navigation) that is built around solid state drive (SSD) technology to offer outstanding power saving and shock resistant properties. MMES is a factory-fitted option. The navigation database can be updated using SD flash cards and the company plans to use this feature to display the location of battery charging stations as they become available. 11 i-MiEV qualifies for "Subsidies for measures designed to promote introduction of clean energy vehicles," currently implemented by the Ministry of Economy, Trade and Industry. For fiscal 2009, intending owners are eligible to receive a maximum subsidy of JPY 1,390,000 on approval of an application submitted to the Next Generation Vehicle Promotion Center (The intending owner must apply for the subsidy and receive notification of its approval before the vehicle is registered). 12 Under current Japanese tax incentives to promote the ownership of eco-cars, the i-MiEV is exempt from the excise and weight taxes normally collectable on purchase of a new vehicle.